Belfast was a wash of red, white and blue yesterday as thousands joined in the Twelfth celebrations. Union flag deck chairs were the order of the day as spectators lined the streets - most in a colourful array of festive dress - to watch the annual parade. Young and old danced in the streets, scenes which were in stark contrast to the previous night's sporadic violence in the area. Lillian Boddington who is originally from Belfast, but now lives in England, said she makes the effort to travel over for the Twelfth every year, regardless of where in the world she might be. "We come every year, no matter where we are. My husband was in the army and I have travelled over for years, from Hong Kong, Germany, everywhere. "I am originally from Belfast, and enjoy the Twelfth a lot. It has been a great parade so far." Belfast man William, who brings his family to watch the parade every year, said the annual event is a good day out for children. He said: "I bring the kids down for a good day out at the parade, they love it. It is a big day out for them, with all of the bands coming down, a bit of craic." Every year people travel from far and wide to join in the fun - and this year the Twelfth won some new American fans who were visiting from Washington D.C. The Patching family travelled over for a tour of the UK and decided to stop off in Belfast for the Twelfth festivities. Kevin Patching said: "I think it is great. They are very impressive how they all march together, they sound loud, they look nice. "Everybody has been nice, it appears to be a family friendly affair. I see a lot of women and children here and I see a lot of people came to set up early, to get a good seat. I would definitely come back for it." Minister for Tourism and Sport for the Republic of Ireland, Brendan Griffin TD, also attended the parade and received the gift of a neck tie from the Orange Order. Elsewhere, Northern Ireland Secretary of State Karen Bradley attended a Twelfth parade in Co Down. The Orange Order claimed the visit to one of the processions at their flagship event was a first. The Staffordshire Moorlands MP attended a parade in Newtownards and was welcomed to the event by the Grand Treasurer of the Orange Order, Brian Dorrian. Orangemen from as far away as Australia were among those taking part in the North Down parade. Ms Bradley watched the procession of 40 Orange lodges accompanied by 30 bands. She also met spectators and other Orangemen, including District Master Mark McDonald. Mr Dorrian said they hoped Ms Bradley had enjoyed her first experience of an Orange parade. "It was a pleasure to welcome the Secretary of State to Newtownards," he said. "We hope and trust she enjoyed her first-time experience of the Twelfth and an Orange parade, and appreciated the pageantry, spectacle and family-friendly nature of the occasion." A spokesman for the Orange Order said Ms Bradley was formally invited to attend a Twelfth parade during a recent meeting with Grand Master Edward Stevenson. He said they believed this was the first time a serving Secretary of State had accepted such an invitation. A spokesman for the Northern Ireland Office did not dispute the claim. Earlier yesterday morning a previously controversial Orange Order feeder parade in Belfast passed off without incident. The early morning procession along the Crumlin Road once sparked riots following its evening return, amid a dispute with nationalist residents. However, the impasse was resolved in 2016 following agreement between the Orange Order and the residents. 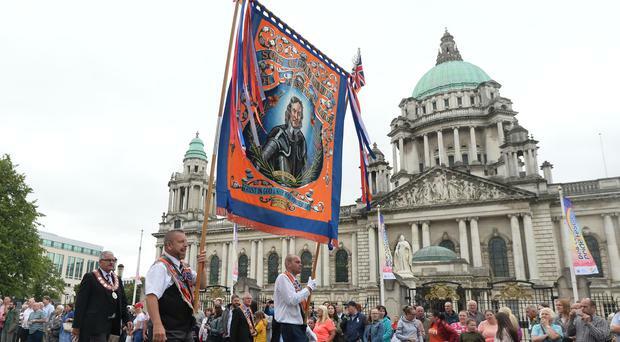 by claire mcneilly THOUSANDS of Orange Order members will be rerouted during this year's Twelfth of July parade in Belfast due to restrictions caused by the Primark fire, it has emerged.